Item # 317123 Stash Points: 3,195 (?) This is the number of points you get in The Zumiez Stash for purchasing this item. Stash points are redeemable for exclusive rewards only available to Zumiez Stash members. To redeem your points check out the rewards catalog on thestash.zumiez.com. Pay your respects to your favorite metal band in the Motley Crue Shout Boxer Briefs from Ethika. These boxer briefs feature Ethika's famous Staple Fit, with flatlock seams, no-rise technology, and a thick elastic waistband. The design is made unique with sublimated graphics of various Motley Crue-inspired imagery, highlighted by text that reads "Girls Girls Girls" at the hip. 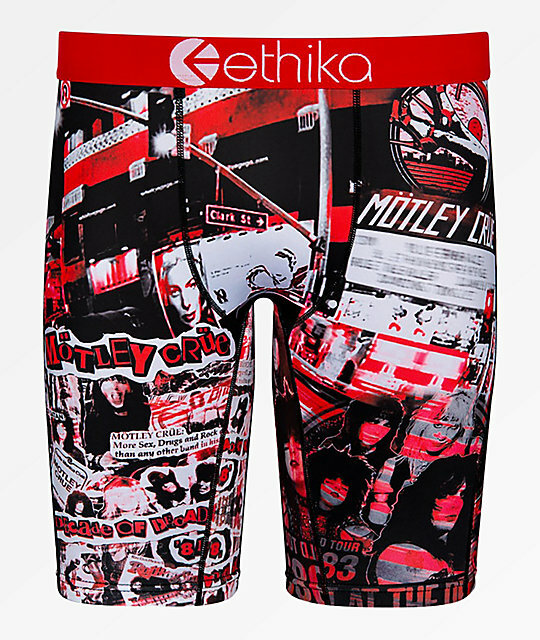 Motley Crue Shout Boxer Briefs from Ethika.